The plan was to hike a 12-13 mile loop down Second Water to Boulder Creek then up the trail along the creek to return via Lost Dutchman Trail. I was looking forward to hiking the creek and shooting some fun angles in Boulder Creek Canyon. Normally, Boulder Creek is a thin stream that casually babbles it’s way down the canyon. Crossing is not terribly difficult and the multiple creek crossings are part of the fun. What I hadn’t really planned for the was the late Winter storm that rolled through Arizona (and much of the southwest) dumping tons of rain and dusting the local peaks with snow. I stuck to my plan and headed out to Lost Dutchman State Park figuring I’d hike my designated route, in the rain if need be, and explore this part of the Superstition Mountain Wilderness. When I hike, the “plan” isn’t much more than a loose sketch…an idea of where I’d like to end up depending entirely on what I might find along the way. I try to allow a lot of wiggle-room in my agenda and very rarely think of my proposed route as “set in stone”. Adaptability and flexibility are the name of the game. My dad used to say something to the effect of, “Plan B makes for better stories”. He was usually right. I had to slog through muddy, mucky trails and cross many drainage washes running with water. There had been so much rain, the ground was soft enough for me to sink a couple of inches with each step in places. For a good section of the downhill side heading into Boulder Creek Canyon the drainage ran down the trail itself (very happy I had my waterproof boots with me on this one). Once I reached Boulder Creek I realized I might need to rethink my plans. The creek was swollen and brown with runoff and moving fast. I had already passed one group that had turned back at the creek, but I wanted to see it for myself. I tried desperately to follow my side of the creek looking for any sign of a trail, or a safe place to cross. I followed a sole set of footprints up the boulder strewn creek fighting through vegetation until I was finally choked out. I sat on a large boulder in the middle of the creek for a long time thinking about what I wanted to do. As I munched on a snack bar, I considered the option of crossing the creek to look for the trail. I considered heading up the canyon wall on my side to see if there was a trail higher up. All of these considerations were sketchy at best and if the storm decided to let loose with another downpour I could find myself trapped on the wrong side of the creek or, worse, caught in a flash flood. Eventually, I succumbed to reason and figured the smart thing for me (or anyone) hiking solo out in these conditions was to head back. I reluctantly headed back the way I came, fighting through the same brush and still looking for a missed opportunity to cross the creek. When I came back to where the original trail met the creek I tried my luck at crossing again but found nothing I deemed safe. So I decided to make the best of it and get the camera equipment out to play with. The storm hadn’t given me much of a sky to shoot. It was very gray and overcast, very little definition and the light was diffused and too soft to create dramatic shadows. My immediate thought was that it might be a good opportunity to play with slow exposure shots. A slow exposure might give me a little boost of light in the scenery. It would also allow me to play with the moving water effects that I always thought looked so cool. I shot a few canyon shots then started playing with exposure times. I took a few shots right down by the creek repeating the same shot with different exposure times to see what I would get. The new shutter remote I got worked perfectly for being able to stabilize the camera on the tripod and get the shot without the risk of shaking the camera. Exp: 1/5sec, F/29, ISO-200, 18mm. I eventually climbed up a small boulder cliff adjacent to the creek to get a better view of the canyon downstream. I snapped a couple of shots then turned the camera around and shot almost directly below me catching a scene where the creek was choked with smaller, colored rocks and desert riparian shrubs. The chocolate milk color of the storm-swollen creek softened the scene and when I slowed the exposure the movement of the water created a nice silky effect. The result was magical. This really turned out to be my personal favorite of this entire set. I love the colors, I love the contrasts, I love the composition. The lichen on the granite rock below me provided some really nice interest and texture to balance out the detail in the rocky side of the creek. The movement of the water flows nicely in a diagonal across the composition dividing the two opposing scenes. It just feels really nice to me. I intend to have this one blown up on a tall canvas wrap for my office. If I had not been forced to abandon Plan A and turn back, this shot would never have happened. I’m happy to see where Plan B took me. You can now purchase Photograph of the Week images from my Virtual Gallery. The Gallery is set up to allow you to purchase prints or digital copies for personal use. A couple weeks ago I went on a short hike in the Superstitions with my camera gear. For the first time in a long time, I carried my ridiculously heavy tripod out into the field. Carrying the D300 along with a couple of lenses AND the tripod adds a lot of weight to the pack and can make it awkward to carry. I also hate carrying the camera in the backpack just because of access issues. This normally results in me carrying the camera through the entire hike. I like to have my hands free when hiking, it’s part of the reason I can’t seem to make myself use trekking poles. So, last week I decided to fix this situation and try some ideas I had. A quick stop at the REI got me what I needed (some of the stuff I already had) and I was set up to test a new camera rig. I picked up a LowePro Top Loading Camera Case from REI. I had to find something that would have quick access D-rings at the top corners of the case or it wouldn’t work (I also made sure the case had a rain cover). 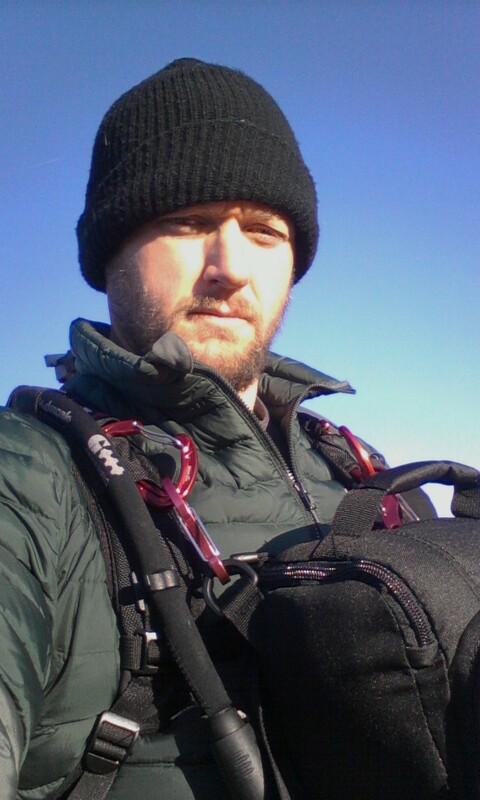 I then added a couple of ultra-light carabiners to my GeigerRig RIG1600 at the shoulder straps. Then, to connect the camera case to the carabiners I used lighweight S-biners. These gave me a little wiggle room with the location of the case and set the top-load flap at a good height for access. The S-biners come in a large variety of sizes so you can customize the hang of the chest rig to fit your sizing. This setup worked great all weekend. The only problem I had with it is the incessant chirping of the metal on metal as I hiked. But that was easily resolved with a little duct-tape where the two biners rub together. After that, it was perfect. I found the LowePro case on sale and I already had the biners so the whole rig only cost me about $20 to set up. You can buy camera chest rigs from manufacturers but most run $80 and up. This worked great for me, fit my camera well, allowed me a hands-free hike with quick access to my camera on the trail. It is also really fast and easy to take on and off when you need to remove the pack. Now I just need to figure out an easier way to strap my tripod for quicker access. The only problem I ran in to with this was not being able to see my feet on technical terrain. That is easily resolved by merely unclipping one side of the camera case. I think all photographers understand that not every trip in to the field is going to be stellar. Sometimes, mother nature bucks against your expectations and you walk away underwhelmed with your collection of photographs. It’s hard, and sometimes counterproductive to go out on a shoot with zero expectations and try to find your inspiration. I’ve tried this approach and often come back with nothing. A couple of weekends ago I was invited out to visit with fellow Photographers/Bloggers Bret (@BretEdgePhoto) and Melissa (@AdventureTykes) at Lost Dutchman State Park in the Superstitions. We had talked about meeting up for a hike, but plans changed and I ended up driving out very last minute to visit them at their campsite. We visited for a while and as the sun approached the horizon Bret asked if I’d like to run out for a quick hike to see what we could get. I of course said yes, grabbed my gear and we were off to find a view of Weaver’s Needle. Bret had seen a trail with a potential view he wanted to explore so we parked his rig and set off down a wash. We hiked the wash, quickly so as not to lose the light, and climbed a few hills looking for the right vantage point. We eventually followed an old Jeep trail to the top of a small hill where we could see Weaver’s Needle in one direction and Four Peaks in the other. Then we waited. The sunset was slow to perform, so I got my camera out and started looking to set up a few shots. I had brought out my tripod, something I haven’t done in almost 12 years, hoping to be able to get some crisp images. As I am pursuing photography again I am remembering and relearning the little things that elevate simple “photos” to “Photography”. I had religiously traveled with my tripod in the past, knowing what I could do on film with a little exposure play. With the DSLR I had become accustomed to using it like an oversized point-and-click digital camera. That is changing. Bret and I sat on the hilltop for a short while. We were hoping for a decent shot of Weaver’s Needle but the light wasn’t cooperating and I became more fascinated with the view of Four Peaks. 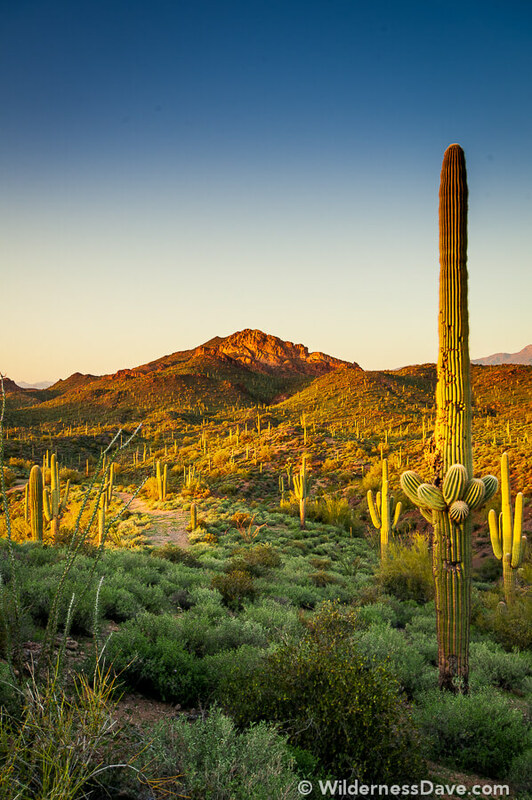 There wasn’t much there, but as the light was getting lower I could sense a subtle glow to the rock, and the saguaros were lighting up like little candles on the hillside and Four Peaks and the mountains in the distance were taking on a nice soft purple hue through the haze. I set up the tripod and took a few shots, really expecting nothing spectacular but wanting to see if I could tell the difference in detail shooting off the tripod. The sky was dull and the sunset fizzled out without any real show. Bret and I packed up and headed back to camp where we continued our visit. Bret and Melissa are really great folks and I was glad I could take them up on their invitation to visit. I went home shortly after dark and put my gear away. The next day I decided to take a look at the images, entirely unimpressed with the originals. I began processing them just to see if the low light had given me enough color and contrast to draw out some detail. Working with the first couple of images was encouraging but they were not the shots off the tripod. When I got to the last few, taken from the stability of the tripod, I was impressed with the difference. I was able to take a slower shot, allowing a wider aperture and the resulting photograph was clean and crisp. Exp: 1/13 sec, F/14, ISO-200, 24mm. With the slower exposure, there was more color to play with and as I processed the image a rainbow of colors emerged. The vertical shot really emphasizes the layers of color. To me, this image feels like a rainbow with it’s layered colors blending to each other. There was enough shadow in the landscape in the foreground that it wasn’t toned in yellows and oranges like the rest of the desert. The previously dull sky now made sense in the composition and I was able to overlay a gradient exposure correction to get the sky to fade to a darker blue. Exp: 1/2 sec, F/29, ISO-200, 24mm. 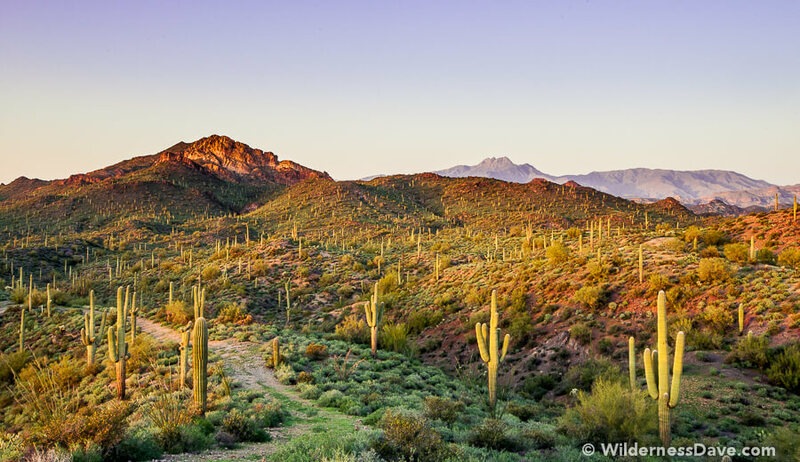 The horizontal shot was able to take advantage of the purple hue of Four Peaks and had the added interest of part of the old Jeep trail in the foreground. This image came out super crisp and clean and, though more subtle, had the same layers of rainbow colors I captured in the vertical image. I had dismissed both of these shots because I had wanted the super dramatic sunset, or the perfectly framed shot of Weaver’s Needle with the light illuminating the peak just right. Instead I got a really interesting, playful, colorful couple of images that highlight the beauty of the landscape and the intricate detail of the rock and cacti. In the end, even without the nice images, I was glad to have met a couple of new friends and share a hike with a fellow photographer (though I struggle to even refer to myself as a photographer in the company of a true professional). One of these days, I hope to get up to Moab to visit Bret’s gallery and join them for some fun outdoors adventures in Utah. You can now purchase Photograph of the Week images from the Wilderness Dave Photography Virtual Gallery. The Gallery is set up to allow you to purchase prints or digital copies for personal use.